Soil-borne cereal mosaic (SBCM) is a viral disease, which seriously affects hexaploid as well as tetraploid wheat crops in Europe. In durum wheat (Triticum durum Desf. ), the elite germplasm is characterized by a wide range of responses to SBCMV, from susceptibility to almost complete resistance. In this study, the genetic analysis of SBCMV resistance was carried out using a population of 181 durum wheat recombinant inbred lines (RILs) obtained from Meridiano (resistant) × Claudio (moderately susceptible), which were profiled with SSR and DArT markers. The RILs were characterized for SBCMV response in the field under severe and uniform SBCMV infection during 2007 and 2008. A wide range of disease reactions (as estimated by symptom severity and DAS-ELISA) was observed. A large portion of the variability for SBCMV response was explained by a major QTL (QSbm.ubo-2BS) located in the distal telomeric region of chromosome 2BS near the marker triplet Xbarc35–Xwmc661–Xgwm210, with R 2 values ranging from 51.6 to 91.6%. The favorable allele was contributed by Meridiano. Several QTLs with minor effects on SBCMV response were also detected. Consistently with the observed transgressive segregation, the resistance alleles at minor QTLs were contributed by both parents. 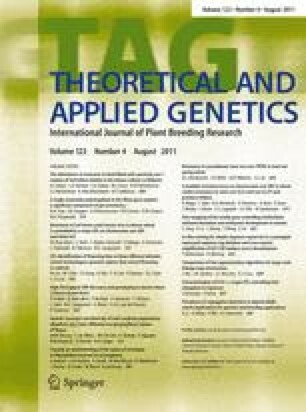 The presence and effects of QSbm.ubo-2BS were validated through association mapping in a panel of 111 elite durum wheat accessions. The online version of this article (doi: 10.1007/s00122-011-1605-9) contains supplementary material, which is available to authorized users. The research was supported by the Emilia-Romagna Region, the CARISBO Bank Foundation (Genomica Grano Duro Project) and by the Italian Minister for Education, University and Research (MIUR), FISR Project “Sistemi, metodologie e strategie per la caratterizzazione e valorizzazione della granella e degli alimenti derivati del frumento duro in ambienti marginali e/o vocazionali”.